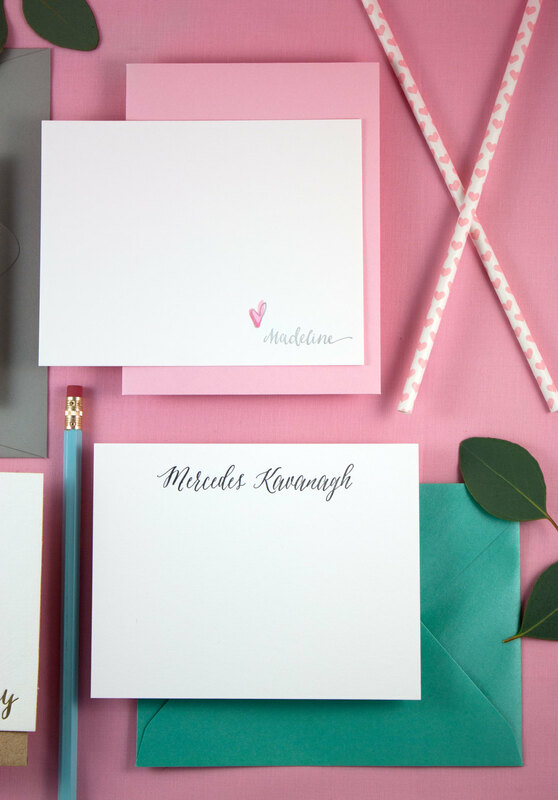 We've been so fortunate to create custom stationery for a few special ladies lately. What a wild week! I am still pinching myself to make sure it was all real. Last Sunday, one of our cards was featured in a Buzzfeed article - “31 Hilarious Valentine’s Day Cards For People Who Hate That Sappy Love Crap” (we are #15). The mention was totally unexpected and I only noticed it once our views and orders started to pick up far faster than normal. The rest of the week was spent furiously back on press - twice! - for additional inventory as well as packing and shipping all of the orders. I am so appreciative of the bonus marketing for bay + boardwalk and had so much fun ramping up our operations just a wee bit faster than originally expected. I am so flattered that so many people loved our card and am excited thinking about the happiness it will help spread this Valentine’s Day. As I reflect back on this week (and as our order volume slowly goes back to the normal rate), I’m reminded of the quote above about luck. I feel incredibly lucky that my card was plucked from Etsy to be featured in such a widely viewed article. Given I only opened the shop a few weeks ago, I am floored by its traction so far. That said, I know a big part of making this week a successful one was all of the preparation I put in up front. Even though the exposure was unexpected, I had everything ready as if I knew it was coming. I’d tested out my packaging, had additional supplies on hand and was prepared to go back on press quickly should inventory get low. So, while it was a surprise opportunity to get such a huge bump in sales in such a short time, my preparation allowed me to enjoy it instead of feeling stressed or overwhelmed. My big takeaway from all of this? Dress for the job you want to have. When opportunity shows up, you don’t want to be caught unprepared. I am so happy I was ready to ramp up quickly and so lucky to have had the opportunity to do so. Thanks for playing, Buzzfeed readers! I hemmed and hawed about the best way to start this blog - what to say, how to write it - and finding the right content for this very first post seems to be the hardest (at least I hope) . Then, I came across this video that I loved - and knew it would be the perfect way to kick off the blog. It was designed by Saar Oz using text from a 2009 interview with Ira Glass. It reminds me very much of my own start in design and letterpress techniques and resonates even to this day. Creativity is a constantly evolving talent and even the best are always growing and enhancing their styles. While this blog is a new adventure for me, the reminder that we all start at the beginning gave me just the boost of confidence I needed to kick it off. I took the message to create as much as I can, as often as I can to heart - so expect many more updates and new projects to come soon!